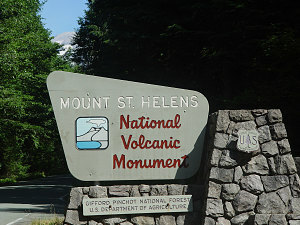 Our next stop is Mount Saint Helens. 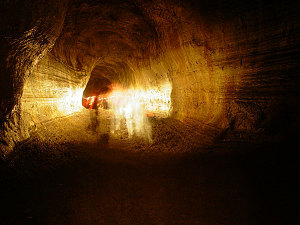 Made famous by the huge 1980 eruption which lopped over 1500 feet off of the top of the mountain and devastated a huge area, Mount Saint Helens is a fascinating place. 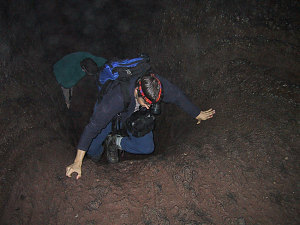 We aim to explore the area thoroughly, culminated with a climb to the summit (assuming we get a permit). First, however, I must mention the strange odyssey we encountered trying to find accommodations this evening. Being a sunny summer weekend, we expect campgrounds to be busy. And it turns out that all of the coast campgrounds are chock full. So we think ok, we'll continue to drive towards mount saint helens, checking out campgrounds and, if necessary, motels, along the way. Well, were we wrong. All campgrounds: full. All motels: full. We are told at one point that all of the motels are full in this part of Washington because of some sort of 'duck' convention....huh? So, after hours and hours and hours of driving, in the wee hours of the morning (it is 2am at this point), we start to get desperate. 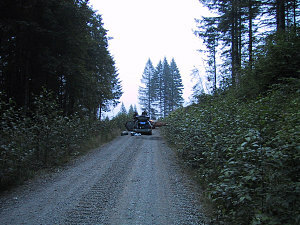 At this point, we are nearing mount saint helens, which is surrounded by logging country. 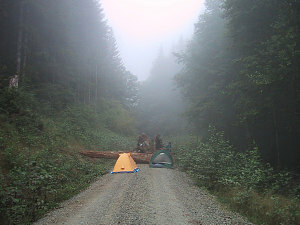 We head up a logging road into the bush and locate a dead-end logging road (see pictures #41, #42, #43) where we pitch our tents, dead tired. Yikes - hopefully this will NOT be the normal order of things. Never have I encountered such difficuly in finding accommodations. 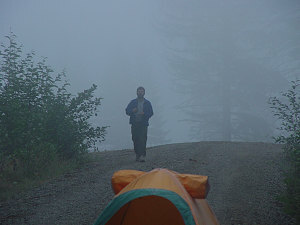 We get up early the next morning from our logging-road campsite, anxious to find a campsite early in the morning before anyone else does. Fortunately, we locate an excellent spot in a nearby campground and that particular worry is over. 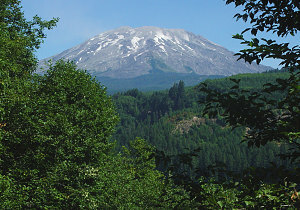 Climbing Mount Saint Helens has became, shall we say... somewhat more popular, after it blew in 1980. 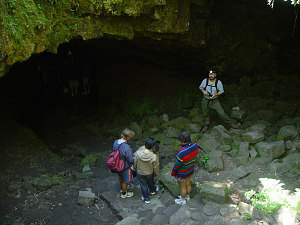 Because of this, the park service has instituted a quota of 100 persons per day on the upper mountain. 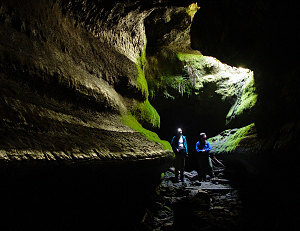 The first 50 positions are obtained by reserving via a mailed-in permit application. These 50 positions go wayyy in advance. 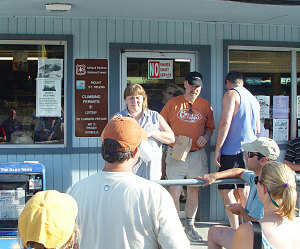 The remaining 50 are given out in a random lottery-like arrangement at one and only one location: Jack's country store, a local establishment on the edge of the park. At 6pm every day, you register yourself, get a number, and, if your number is called before 50 positions have been allocated, you get to buy a permit and climb the mountain. An interesting system. On the weekends, there is almost always an excess of people and a guarantee of long faces. However, we deliberately engineered our arrival such that we were bidding for permits for a weekday (a Monday). 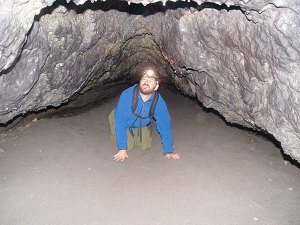 Before the permit lottery we had most of the day to kill, so we decided to explore a very long lava tube at Mount Saint Helens, known as the "Ape Cave". 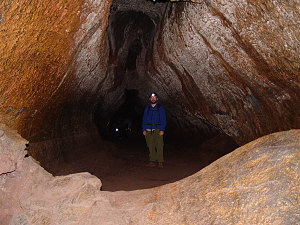 This tube is the longest known lava tube in the US at about 4 kilometres long. 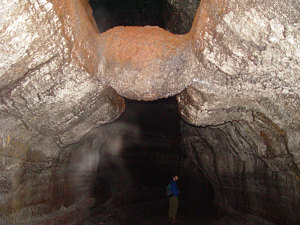 There is a hiking route that goes through the entire length. 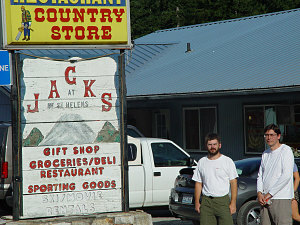 After spelunking for the afternoon, we headed back to Jack's store to see if we'd get a permit for climbing St. Helens. 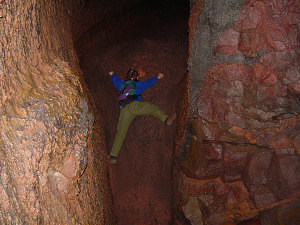 A neat experience, this climbing lottery. Even though it looked like there was less than 50 positions being bid for, you can never be sure, and so there is an air of baited breath as one of the staff stands outside the front of the store and calls out numbers.... (see the pictures and movie clips). It takes a while, but my number is called, and we manage to get our permits (at $15 USD per person though - not cheap). Back to the campground, some Alpine Aire suppers, and to bed early.